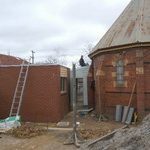 In 2008, after an eighteen month battle to get a Planning Permit, restoration, renovation and building works were commenced at St. Mark’s. The problems arose when the Heritage Officer did not agree to the original plan for an extension to be built onto the front/side of the church. The extension was for a kitchen and toilet area to be added as these facilities were not available at the church. After some time, a suitable plan was drawn up to add on via a link from the rear/side of the church. The Heritage Officer suggested that the extension should be contemporary and built in corrugated iron running sideways! Again, after much negotiation, it was agreed that it could be built in brick and a coloured (green) render added. During the period from when this was agreed until the actual permit was issued, the Heritage Officer left and the issued Planning Permit stated that the extension should be built in heritage red brick (as per our original application). The major part of the restoration work involved the stripping back and repairing of the lower wall areas to fix the rising damp. During this time, as with most work on older buildings, other problems were discovered. The hollow cavity walls were found to contain “old nesting material” and a super sucker had to be called in to remove the material before treatment for the damp could be carried out. The carpet had been rolled into the centre to avoid damage during this work and a section of the floor was found to contain white ant damage. 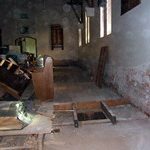 A price had been obtained for the restumping of the church floor, this now changed into a partial replacement of the damaged section. This work gave us the chance to alter our thinking and it was decided to remove two of the existing four levels in the floor giving one level floor area for the body of the church and out into the new extension and reducing the raised sanctuary area from two levels to one. Renovation work involved the upgrading of the old lighting system where wiring was in tin conduit and the existing lights were very inadequate. The old outside meter box and inside switch board were also replaced and relocated. 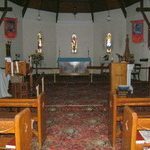 With the improvement to the lighting, including uplights, the beautiful timber ceiling was now highlighted and when the the final paintwork was completed the whole church took on a new warm look, enhancing the existing stained glass windows and opening up the church with a clean fresh appeal.